Joseph Hermann served for 28 years as Director of Bands at Tennessee Technological University. Under his leadership the Tennessee Tech Bands grew to a level of national prominence, over 25 new pieces were premiered, and the wind and percussion program became an influential force for bands in the Southeast. Before his appointment at Tennessee Tech in 1989, Hermann was a director at the University of Arizona, Indiana University, and East Tennessee State University. His secondary school teaching includes directing the Dowling High School Band, West Des Moines, Iowa, and supervising the Des Moines Catholic Instrumental Music Program. Under his leadership, the school music program grew to unprecedented enrollment. In addition, he served briefly as the Educational Director for Bands of America and McCormick’s Enterprises, a music corporation, in Chicago, Illinois. Hermann is sought after as a conductor, adjudicator, and speaker and has presented clinics, workshops, and has conducted in over thirty states, in Canada, and throughout Japan. His symphonic bands have been featured ensembles at state, regional and national conventions; his interpretations have been broadcast on National Public Radio, and recordings of his ensembles have been issued as reference for music educators nationwide through music publishers and on commercial labels. 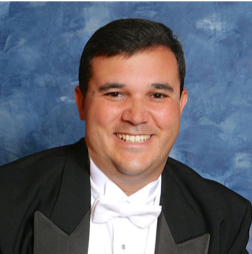 Dr. Anthony Pursell is Director of Bands and Associate Professor of Music at the University of Central Missouri. Dr. Pursell directs the Marching Band, conducts the UCM Wind Ensemble and Chamber Winds, and teaches undergraduate and graduate courses in conducting and music education. Prior to joining the UCM faculty in 2017, he was Director of Bands at Tarleton State University in Stephenville, Texas (2010-2017) and the Associate Director of Bands at Kansas State University (2005-2010). Dr. Pursell’s professional affiliations include the College Band Directors National Association, the Missouri Bandmasters Association, Missouri Music Educators Association, the National Association for Music Education, Phi Mu Alpha Sinfonia, and Phi Beta Mu. He has honorary memberships in Kappa Kappa Psi and Tau Beta Sigma. In 2012 he was named as a contributing editor for The instrumentalist Magazine. He earned his Doctor of Arts degree in instrumental conducting from Ball State University and the Master and Bachelor of Music Education degrees from Loyola University in New Orleans. Dr. James Spinazzola is an active conductor, ensemble clinician, saxophonist, and arranger. He is currently Visiting Associate Professor of Music at Cornell University, where he directs the wind ensemble program, teaches undergraduate courses in music theory, and coaches chamber music. Under his direction, the Cornell Wind Symphony has performed at the Eastern Division conference of the College Band Directors National Association; has premiered new works by David Maslanka, Christopher Rouse, and Dana Wilson, among others; and has collaborated with notable composers and soloists such as David Maslanka, Wynton Marsalis, Joshua Redman, and Patrick Williams during on-campus residencies. The ensemble is also committed to exploring music as a vehicle for global awareness and cultural exchange, and in 2017 embarked on an international service-learning tour to Haiti and the Dominican Republic, which included performances at the Kiosk Occide Jeanty, Port-au-Prince, as part of the 2010 Earthquake Commemoration led by provisional President Jocelerme Privert; and at the UNESCO World Heritage Site Palais Sans-Souci in Milot, Haiti, among other venues. James was previously a tenured faculty member at the University of Indianapolis, where he served as associate professor of music and director of instrumental activities. Additional posts have included those as assistant professor of music at Tennessee Tech University. As a guest conductor, he has worked with numerous bands, orchestras, and jazz ensembles throughout the world, including All-State jazz and concert bands. He also lectures frequently on a variety of topics, most recently on rehearsal pedagogy at the Midwest International Band & Orchestra Clinic. As a saxophonist, James has recorded a solo album for the Mark Custom label, Discovery: Standard and Emerging Works for Saxophone and Wind Ensemble, and continues to perform in both jazz and classical venues. He is also a proficient arranger, and his work is published by Alfred Music, Boosey & Hawkes, and Subito Press. James holds degrees from Duquesne University (BS), the University of Colorado (MM), and Louisiana State University (DMA).